I´ve heard of abattoirs in the UK that play classical music to the animals while they are waiting for the chop and on a more pleasant note, people have been known to play classical music to their unborn children but classical music in a wine cellar? For the barrels? Well, why not? They are slowly “growing up” as the French refer to maturation (elevage) in the barrel. We were listening to the soft strains of Listz while down in the very modern wine cellar of Kirnbauer Vineyards just outside Duetshkreuz, Mittleburg, Austria. 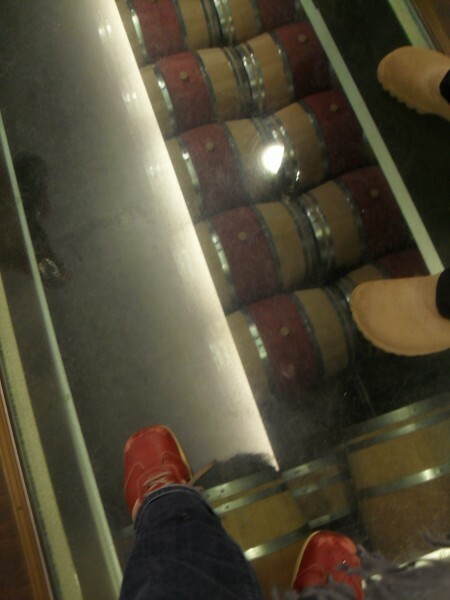 Their cellar is very new replete with a plexiglass walkway above the cellar so you can look down and see the barrels while walking above them. 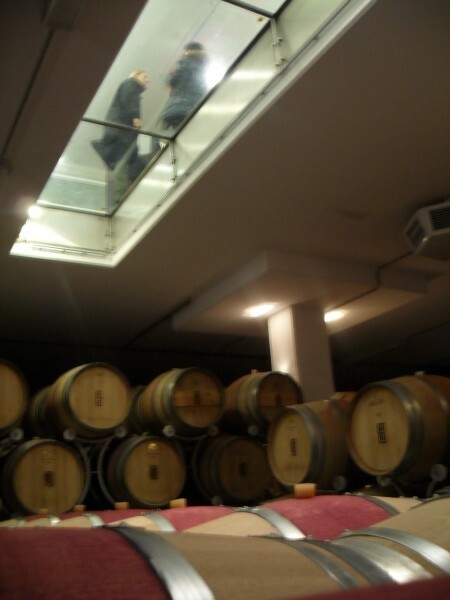 Conversly, Markus says in summer, it’s also fun to be in the cellar looking up….the boys seemed to agree with that statement…but anyway… Listz was born just 5 kms away and the winemakers thought it would be nice to have local boy playing along to the local grapes. Kirnbauer is a family owned and operated vineyard near the town of Deutschkreuz, amongst the hills of Mittleberg and close to the Neusiedlrsee. Together, they create a unique microclimate that allows for the grapes to flourish, the hills protecting them from the winds and the shallow sea creating a warm pocket for the grapes to grow. 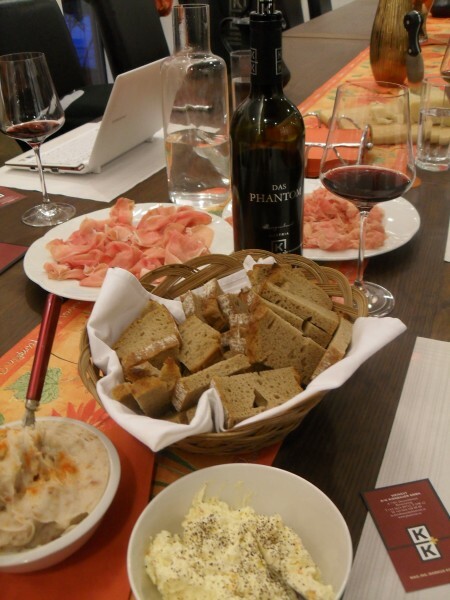 An interesting tidbit I picked up on my trip to Burgenland with a group of winebloggers after the European Winebloggers Confernce in Austria recently. Kirnbauer specialize in blaufrankisch and, indeed the area is known as blaufrankischland because it grows so well there. A red varietal that is the specialty of Austria, blaufrankisch is a mineral laden red wine that comes from mostly the East of Austria in the area known as Burgenland. Often sporting boysenberry and red berry flavours, spice and slate notes with, depending on the area and style, either mouth coating tannins or round and elegant, it´s red wine that´s hard to ignore. 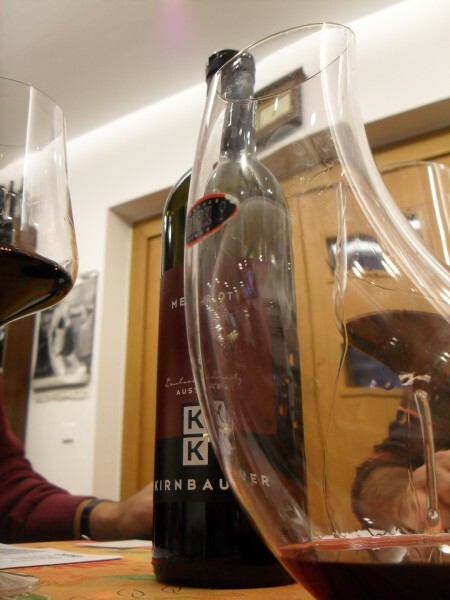 While I was in Burgenland, I tried many different blaufrankisch and many of them were just too muscular and tannic for me while not having quite enough balance to them but Kirnbauer´s wines were elegant and subtle, very well balanced between fruit, acidity and tannins. Markus Kirnbauer was our guide to their cellars and as he showed us around his 1000 barrel cellar jumping from barrel to barrel, I could taste those hallmarks of their wines. The Kirnbauer´s age all of their wines for at least 18 months in barrel, allowing them to go through malolactic fermentation there and they are often aged up to 24 months before being bottled. Blaufrankisch needs that time to mellow and round out the tannins. 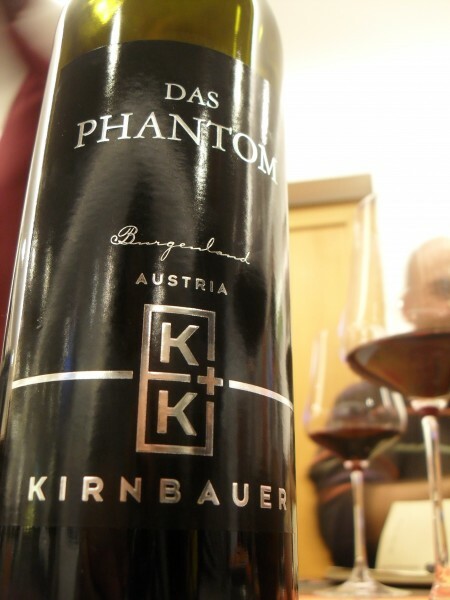 The family also grows merlot, cabernet and syrah and produce one of the first Austrian blends, The Phantom. We tasted the current vintage, the 2008 Phantom along with a small repast of rauchenden (cured wild boar, very similar to spanish jamon but a bit lighter in colour and delicately flavoured, the pigs are local and are fed acorns) egg mayo, a big jar of pork fat with hunks of crackling scattered throughout and (very un-Austrian but good nevertheless) Grana Padano cheese. 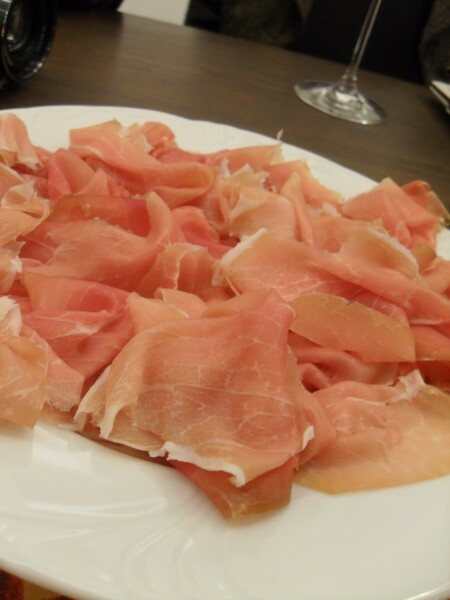 It seems like I am encountering a lot of grana padano lately or maybe I´m just paying more attention. The 2008 was the 20th anniversary vintage of Phantom, it being first blended in 1987. The wine is a composition of blaufrankisch, cabernet, merlot and a small drop of syrah (5%), each wine fermented and aged separately before being blended and then put back in barrel for a further 4 months. A complex nose of dried fruit, herbs, and spices, the fruit really jumped out when washing down the food, black cherries dominated and I detected dark chocolate flavours on the finish. 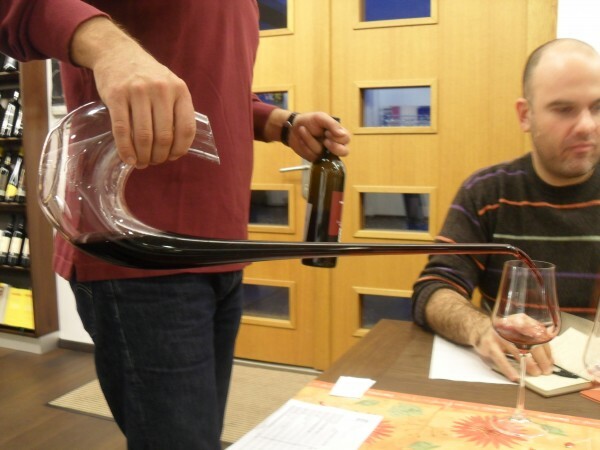 This was a wine that´s certainly made to go with food. It really comes to life. Markus also remarked on the elegance of the wine and he mentioned that they try to move the wine around as little as possible because they believe it “stresses” the wine out. They also only do bottling at or around the full moon because they believe it´s the best time to bottle. Markus was careful to emphasize that they are not biodynamic growers, they´ve just noticed a difference in the wine depending on when it was bottled. 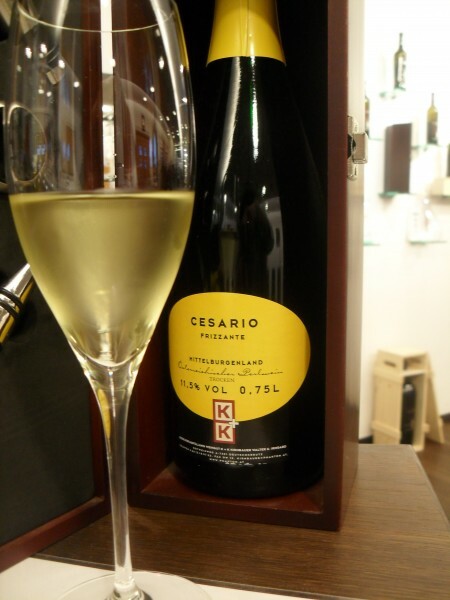 Kirnbauer also do a sparkling wine made from sauvignon blanc, the Cesario. A light elderflower inflected wine with spritely bubbles, a touch on the sweet side, as good an introduction to Austrian sparkling wine as I´ve had and actually much better then many others. 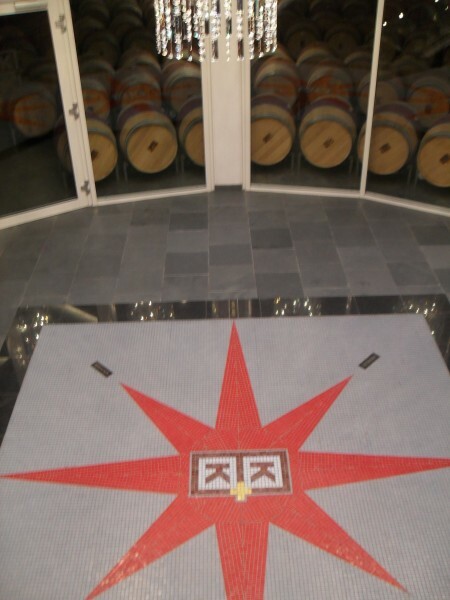 We could have spent the rest of the afternoon sitting at their tasting table, drinking the Phantom and a merlot that Markus also brough out for us to try but we got a phone call from the others waiting for us back at the wine center so we had to take our leave. I was surprised to see a merlot in such a climate but the Kirnbauer´s seem to know how to deal with these red varietals and the merlot while not your typical merlot was very well done. Peppery, herbal and very mineral driven, the fruit taking a backseat to all that, it had spent 2 years in oak barriques and the result was a uniquely Austrian merlot. I don´t know if I would have said it was a merlot in a blind tasting but it had some very interesting characteristics to it and it was delicious, so a win-win situation all round. I´m so glad that Iwas able to visit Kirnbauer because they are definitely one of the better producers of blaufrankisch in Burgenland. And great hosts as well! Lovely article – thank you for sharing! 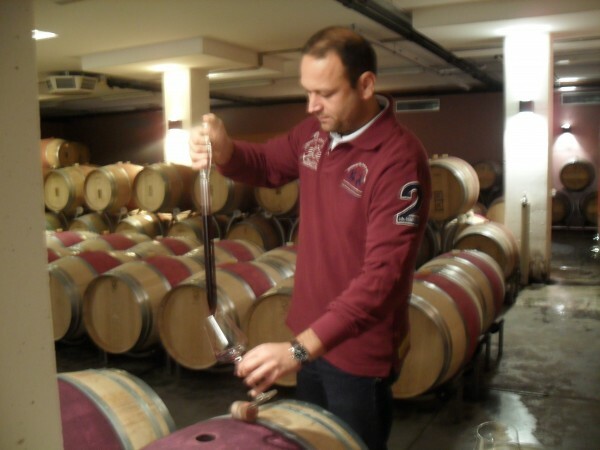 I really enjoyed reading it as I missed out on Burgenland on this trip… I know Montes in Chile play classical music in their barrel hall as well and it does make for some great wines. Am going to try and find some Phantom as I would really like to try it. Thanks Caroline! I don´t know if they export or where but you can always drop Markus a line. Thanks for stopping by! 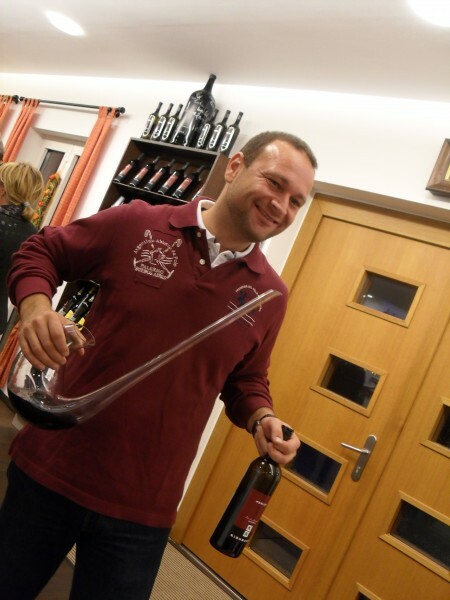 I want that decanter too 😉 Seems you had fun in Austria! Thanks Brett and Torsten, it was a most enjoyable visit! Would love to go back in the spring, summer….